Founded in 1963, Meadgate Church is an Anglican (Church of England) Church. We are a thriving, friendly Church in the middle of the community of Meadgate. 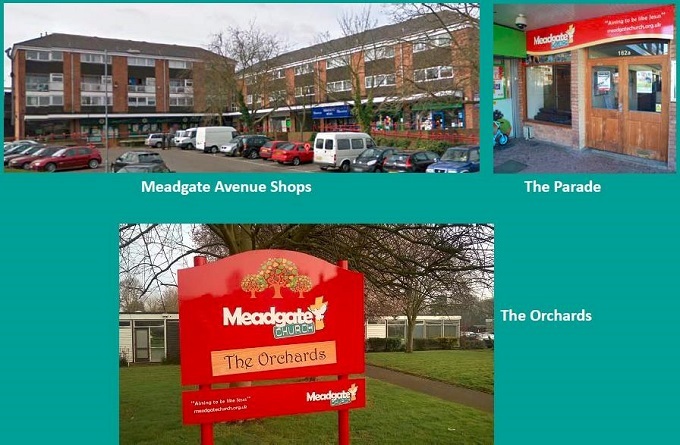 We have two locations, the original Meadgate Church building, known as the Parade, situated within the Meadgate Avenue Shops, and the Orchards next to Meadgate Primary School. Everyone is welcome to join us whether you’ve been going to Church for years, haven’t been for a while, or are just interested in finding out more. 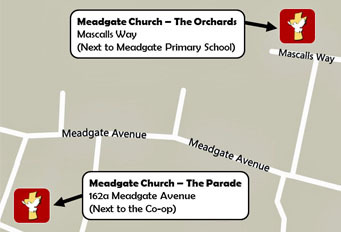 On a Sunday we have two services that cater for all tastes, but Meadgate Church doesn’t end on Sunday - you can normally find something going on every day of the week and you’ll find details of all that we do in the menu links on this website. We hope you’ll drop by, on a Sunday or during the week, and find a warm and welcoming atmosphere. We are a lively bunch of people, young and old, and are simply trying to follow the example Jesus set for us - hence our mission statement "Aiming to be like Jesus." Take a look at our What's On, Calendar and Sunday Services sections of the website to find out about the regular activities that occur at Meadgate Church.